The Rechargeeable Led Road Flares work well and are a great safety and emergency light as well as ones to keep around the home for safety and regular use. Rechargeable LED Road Flares is the 9-in-1 highly visible LED flare. The Rechargeable 9 in 1 Led Road Flares is an ingenious safety product that should travel with everyone who drives a motorcycle or car. This compact ultra bright flare will make you and your vehicle visible from a half mile away. The ultra bright led light has 9 different functions and light patterns. Several light patterns are directional so it can be used as a flashlight for roadside repairs and inspections. If you have to stop on the side of the road, just grab the Rechargeable 9 in 1 Led Road Flares Light and it attaches to your motorcycle or car in seconds with the heavy duty magnets. On coming traffic will see you better and much better thus greatly increasing safety. Grad one for your motorcycle and each car and you and your family will have the peace of mind of having visibility in the event of a roadside stop. The Rechargeable LED Road Flares is a red LED rechargeable light with 9 separate light and flashing combinations for safety and emergency use that recharges easily with the enclosed adapters.The Rechargeable LED Road Flares includes the puck light itself, a magnetic base for charging, a car outlet and household plug in with a USB cable for charging. The Road Flares has the USB cable for plugging the charge base into either the household adapter or the vehicle adapter as well as your computer or other USB powered device. is a great item item for traffic control, power blackouts, earthquakes, rescue signal, car driver, tactical police, military operations, vehicle breakdown, firefighters, EMTs, SCUBA diving, rescue services, first responders, members of emergency response teams and the general public and widely used in bike, cars, motorcycle, trucks, boats, equipments, marine, RVs, semi-trucks, airport, construction zones, DUI checkpoints, mass casualty, disaster incidents, personal safety and emergency response vehicles. Led Road Flares is especially designed for police, firefighters and rescue first responders to assist them during their work. This unique technology is now available to consumers and essential to keep in your automobile and to take along on your next boating, biking or hiking trip. Led Road Flares has 9 flash patterns; including U.S. Coast Guard approved SOS-Morse code. It runs up to 100 hours on the replaceable CR-123A non rechargeable battery. The unit can be mounted to metal object using attached magnet or hung using eyelet or by simply placing on ground. Led road flares is a lighting option specifically designed to be mounted onto emergency, construction, or work vehicles. Led road flares are designed to provide highly visible warning and caution to on coming vehicles when your car breaks down, to approaching motorists of potential hazards and specific directions to motorists, protect your safety and prevent car crash. Led road flares is used as lantern in case of power failure, earthquake, hurricane or other disaster.It is seen in the dark. Be bright at night on the road at a construction site or work site. Alert other workers or passers-by that you need help and are under duress when shouting does not help and want help from emergency services. Each led warning light is designed with an easy-to-install assembly for any truck, fleet, or emergency vehicles application. 1. Safer and ecologically better for our environment then flame style emergency road flares. No spark, open flame, fumes or toxic chemicals are produced when using the LED road flares. 4. The LED road flares is waterproof and floats on water so it may be used for marine application and safely in wet environments, including submerged to a depth of 33 feet. Will float unless secured. 6. LED road flares will keep a full charge for 90 days. After 6 months, it keeps 70% power; Ater 1 year, keeps 50% power; After 2 years, it keeps 40% power. Press ON/OFF button on led road flares to select the following 9 light patterns. Led road flares will bring you safe and secure and can be used as follows. 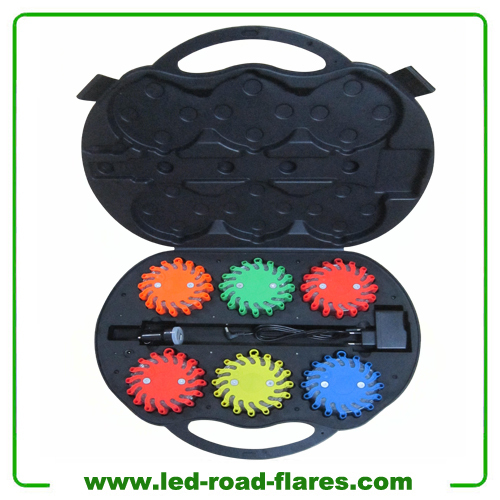 *Led Road Flares is seen in the dark. Be bright at night on the road at a construction site or work site. Alert other workers or passers-by that you need help and are under duress when shouting does not help and want help from emergency services. LED Road Flares is an ideal signal light to identify Road Hazards, Mark Detours, Underwater Repair Applications And More and A great item to keep in your vehicle at all times that can be used to signal for help or identify road hazards and used for traffic control, firefighters, EMTs, rescue services, first responders, members of emergency response teams and the general public and used in cars, trucks, boats, RVs, semi-trucks, construction zones, and emergency response vehicles. 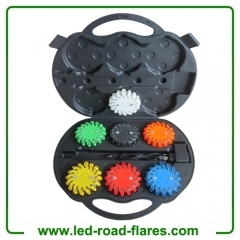 The 6-Pack Rechargeable Led Road Flares has 9 functions with the ring of red LED lights that circle it giving you the various combinations using an included computer circuit to light up the RED LED’s. The light combinations include rotating around the puck, quad flash, single blink, alternating blinks, SOS Morse code, steady on with high and low output, 2 and 4 LED flashlight. The Led Road Flares is a great safety light with the various attention getting flashing and blinking lights along with the on with two or four of the LED’s to use for a regular flashlight. The two and four LED lights work well for emergency use like changing a tire or finding your way when the power goes out while the rest are great for attention getting. 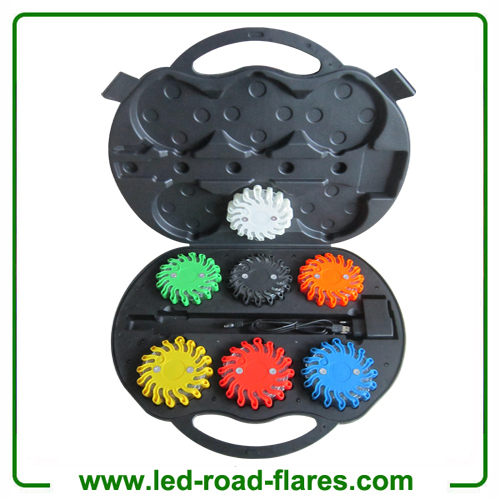 We are Led Road Flares Manufacturer Supplier Factory in China. OEM/ODM for Led Road Flares is welcome.